Announcing Industry-First Phone Health System with Alerts! CallRevu, the automotive solutions company that monitors and monetizes the caller’s journey from call to purchase and post-sale, announced today an industry-first Phone Health monitoring system with alerts for release to all of the company's customers in March 2019. The Phone Health Alerts will be sent to a designated person, triggering one time during a seven-day period unless the issue escalates. Default thresholds were created for Watch, Warning, and Emergency alerts, but dealers can also customize the threshold for all three alerts. 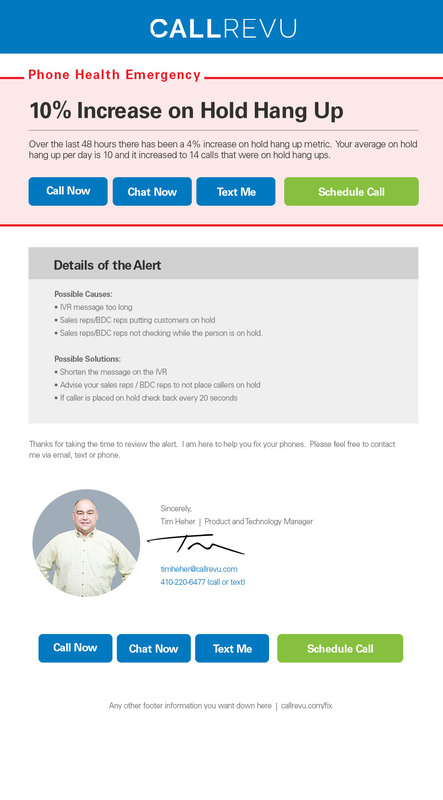 Ongoing or escalated phone health issues on the new system will automatically trigger an Emergency alert that notifies dealership decision-makers that a major phone problem exists.